Are there any stories more hackneyed than stories of adultery? Possibly not. So, let’s imagine you’re a writer and you want to write a novel about adultery. How would you do it? You could hunt for a really sordid story. Or you could infuse your story with a heavy dose of original writing and, at the same time, make writing about adultery your topic. 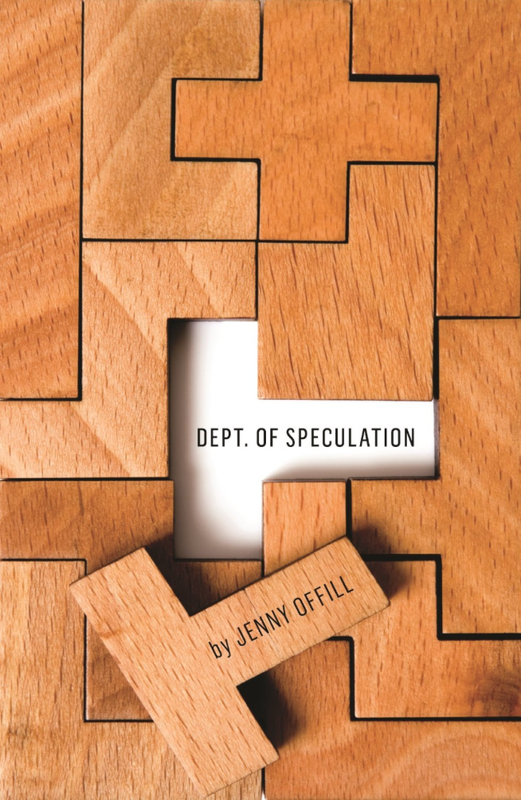 If you went down that road you might end up with something like Jenny Offill’s Dept. of Speculation. We’ve read the story she tells so many times before, but we never read it told the way she chose to tell it. The plot is summarized quickly. A woman and a man meet, fall in love, get married, have a child, are happy. Then he cheats. She’s devastated. They fight and grieve and get back together. Jenny Offill could have told this many different ways, but she chose a fragmented approach. Maybe I’ve read too much flash fiction and prose poetry recently, but to me, that’s exactly what Dept. of Speculation is— a novel in flash fiction form. Like flash fiction, it’s highly condensed, pared down, stripped of anything superfluous. It uses formatting as a means of expression, short paragraphs that are arranged like verses in poems. It’s episodic, uses defamiliarization and counterpoint. Reverses expectations, wants to surprise. All characteristics of the condensed art of flash fiction. And it works. Almost every element, each paragraph that has been set apart, can be read individually, like a mini-story. They all offer something and, just like the wheels of a clock, are perfect in themselves. There’s an interesting use of POV. Before the adultery there’s a first person narrator, after the adultery the POV changes to third. Instead of the pronouns You and I Offill uses “the wife” and “the husband”. Only in the very last chapter she slowly moves back to first person, almost imperceptibly. Maybe it was the only way to write about the sorrow, pain and grief and avoid cliché and bathos. The result was that I felt kept at arm’s length by the book as a whole, but the individual parts moved me often. The narrator is a teacher of creative writing. She writes about her student’s stories but, also about her own and how it should have been written differently. I liked those metafictional parts the most. Of course we wonder how autobiographical it is. At times I felt like reading a personal essay. There’s a lot to love in this book. Many sentences and passages I admired. Telling such an age-old banal story but infuse it with so much originality – form and thoughts – deserves high praise. And it goes beyond adultery. There are passages in which Offill captures bliss and joy without being corny. Passages in which she praises the wonder of creation and the vastness of the universe. Domestic bliss meets transcendent happiness. Nonetheless, I couldn’t enjoy it unreservedly because it was too much. For a novel it was almost too rich and for a short story collection it lacked variety in tone, atmosphere, and mood. It’s a hybrid form, and, as such, needs a specific kind of reading. One night we let her sleep in our room because the air conditioner is better. We all pile into the big bed. There is a musty animal smell to her casts now. She brings in the nightlight that makes fake stars and places it on the bedside table. Soon everyone is asleep but me. I lie in our bed and listen to the hum of the air conditioner and the soft sound of their breathing. Amazing. Out of dark waters, this. How has she become one of those people who wears yoga pants all day? She used to make fun of those people. With their happiness maps and their gratitude journals and their bags made out of recycled tire treads. But now it seems possible that the truth about getting older is that there are fewer and fewer things to make fun of until finally there is nothing you are sure will be never. She would not have let one of her students write the scene this way. Not with the pouring rain and the wife’s broken umbrella and the girl in her long black coat. To begin with, she’d suggest taking out the first scene on the subway, the boring one, where the wife pretends to be a Buddhist. (I am a person, she is a person, I am a person, she is a person, etc. etc.) Needed? Can this be shown through gesture? She has wanted to sleep with other people, of course. One or two in particular. But the truth is she has good impulse control. That is why she isn’t dead. Also why she became a writer instead of a heroin addict. She thinks before she acts. Or more properly, she thinks instead of acts. A character flaw. Not a virtue. If you’d like to read another review. Max has reviewed here. This is the third book of my 20 under 200 project. It’s good the author found a new way to tell an age old story. Great review. Thanks, Ali. She really did. But I guess, it’s not everyone’s thing. I knew you were going to review this book, so I re-read it. (Glad it was a novella, because I never re-read anything. :)) Also, I couldn’t remember a thing about it, except the marriage unraveling! The first time I wasn’t that impressed, although I did think the author really captured the near-insanity that happens with cheating. The second time, I wasn’t so distracted by the stream-of-consciousness style and the random tidbits about everything. There’s very little action, so that probably makes it harder to remember. What’s left is a slow-building account of the wife’s reaction to betrayal and what she’s sacrificed to be in said marriage. I liked the book so much more after I re-read it. And “whisper-fighting”–what a great expression. Thank you, Carole. Wow, you re-read it? That’s nice. I might re-read it at some point because I really liked a lot of it but maybe I would only dip into it here and there. Max writes in his review about the same reaction you had. He liked it while reading it and a couple of weeks later noticed he’d forgotten all about it. Yes “whisper-fighting” is fabulous. She’s got many gems like that in the book. I was going to mention Max’s review. I saw this one mentioned all over the place a few months ago but decided to pass on it in spite of the mostly positive reviews. I’m not sure it would be for you. I did really like it though. I must admit to feeling a bit ambivalent about this book. Max’s review prompted me to pick it up from the shelf, and while I quite liked some of the writing, I didn’t love it. That said, I really like the way you’ve positioned the book in your review – flash fiction is a good way of thinking of it. I’m glad to hear you think my approach works. Once I saw it as a series of flashes, it worked far better. I wouldn’t say I loved it but it has some great passages. I was hoping you’d review it when I saw your comments on Max’s blog. I usually like creative writing styles. So much writing seems so conventional that it is nice to read something different. I do not think I have read much, or any, flash fiction before, It sounds interesting. I think you’d like this book and flash fiction. It’s somehwre between prose poetry and short stories. I can recommend Kathy Fish’s collection Together We Can Bury It – but a lot is available for free on her website. There are many, many others of course, but I do like her writing a lot. It’s my take on it, of course but I’m realtively sure that’s what she did. Hmmm. Now that you mention it I have a feeling I read your review. I’ll have to find it. I remmeber I wasn’t to ken on reading it at first but then suddently I saw it mentioned somewhere and it sounded good. I had a strange reaction to it. As you’ve probably noticed, I either totally love something or really don’t love it: for me, there’s not much of a middle path in literature. 🙂 I liked the writing, but I thought there was a fair amount of MFA ‘being tricky on purpose’ writerly conceit in the execution of the novella? Maybe I was disappointed because the book was so hyped when it came out and it wasn’t at all what I expected. history of literature or literary theory this would not work at all. I like the notion of a book comprised of flash fiction, and I do like Offill’s writing, but in the end I think this book probably won’t be for me. I don’t read a ton of fiction with a contemporary setting (for whatever reason), so when I do, it has to call me very strongly. I get that. It’s a peculiar book. I liked a lot of it but it won’t make my end year best of. Btw – I have a hard time commenting on your blog. You changed something, right? I was given this as a present and I think I’m looking forward to reading it… most reviews I’ve read have expressed mixed feelings. I’ll be interested to see how it strikes me. Generally, I appreciate innovation if it really fits with the content, and I can imagine a fragmented style being appropriate to the huge emotions provoked by adultery. I hope you’ll read it soon. I’d be so interested to know what you think of it. I liked it better than I thought I would but, like Max, I seem to be forgetting it. I thought she managed to capture the emotions very well. The craziness, the angst. I liked it – I commented on Max’s review, so I won’t repeat all that. I would like to reread it, which is some kind of praise. It’d be interesting to see what it’s like second time around, when there’s less of a surprise for the reader from the form Ofill has adopted. I’m not surprised you liked it. I think it will improve the second time. I’m not much of a reread so it will take some time until I?ll test that theory but I could really imagine it will bet better. I have to go back and read the comments onMax’s review. Thanks for the linkback. Your reaction sounds similar to mine, though I didn’t pick up the flash fiction comparison which is interesting. Pearlsandprose’s comment about rereading is also rather interesting. John Self, who loved it, read it twice before reviewing. I do wonder if this is a novel which is a better reread than it is a read. You’re welcome. I certainly agree with you – one forgets it rather quickly. I’m sure it’s better the second time around or read – like I tried- as a series of short, interlinked fiction. I think it’s better than one would think at first. It’s really very tight. Thanks, Vishy. I enjoyed reading it. I’d say it lived up to the hype. If you’re looking for something unusual but still heartfelt – it’s really good.